Katrina Kaif knows how to play Holi! The actress was spotted playing with colours and letting her hair down at the Zoom Holi party in Mumbai on Thursday. Katrina was the life and soul of the Holi party in a colourful ensemble by Anamika Khanna. She paired it with sneakers. So cool! 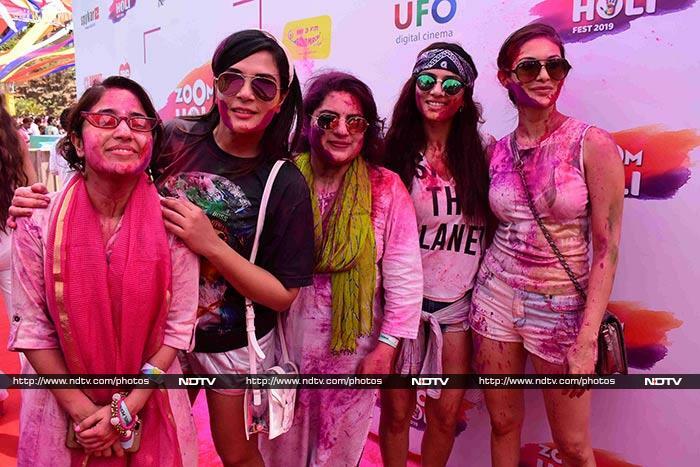 Also present at the Holi party were girl tribe Shweta Tripathi, Amyra Dastur, Mallika Dua and Sapna Pabbi - all of who featured in the series The Trip. Richa Chadha joined them for a photo. Mandana Karimi was Holi ready like this! Mard Ko Dard Nahi Hota co-stars Radhika Madan and Abhimanyu Dassani splashed colours on each other. Veere Di Wedding actor Sumeet Vyas also had plenty of fun. At another part of town, Vikramaditya Motwane's Holi party had guests like Preity Zinta. She played Holi with the paparazzi! Arjun Rampal and his girlfriend Gabriella Demetriades were spotted party hopping. Kim Sharma played Holi with Preity and others. Iulia Vantur was tattoed with colours of Holi. Meanwhile, Shabana Azmi and Javed Akhtar hosted a Holi party, where Farhan Akhtar and his girlfriend Shibani Dandekar were spotted together. The hosts had a blast, clearly. Actress Divya Dutta was all smiles to have attended the party. Actor Rohit Roy came with his family and danced to the beats of dhol. Actor Rahul Bose sported an unusually clean look for Holi.